Consumers Union is the policy and advocacy arm of Consumer Reports. Jean Halloran sat on the 2004 FDA Food Advisory Committee that helped develop the previous advice on mercury in fish. Consumers Union agrees with the basic proposed FDA/EPA advice, with some exceptions. We are particularly concerned with a growing trend toward higher mercury levels in canned tuna, and urge FDA/EPA to recommend that pregnant women eat no tuna at all during their pregnancy. Women of childbearing age who are not pregnant should be advised to eat no more than 4.5 ounces per week of albacore. There are many benefits to eating fish, and data show that Americans, and especially women of childbearing age, are not maximizing the potential benefits of fish consumption to themselves and their children. We strongly disagree however with using the “net benefits” approach to deciding what the advice to consumers should be, as this will not maximize public health. The “net benefits” approach, which seeks to quantify both the nutritional benefits of eating fish, and the risks of consuming mercury, and then balance the two to see which is greater, is deeply flawed. We simply do not have sufficient scientific information to accurately quantify either the benefits or the risks at this time, much less to attempt to trade them off against each other. But more important, the net benefits approach, even if it could be well executed, is a misguided effort, because it does not lead to maximizing public health. Public health will be maximized if the public, and particularly women of childbearing age and young children, increase their consumption not of all fish, but rather of LOW MERCURY fish. Even if the nutritional benefits of fish consumption may in some cases counteract the well-known detrimental effects of mercury exposure, it is not necessary to balance the two. The public can get the benefits of eating fish while completely avoiding the detrimental effects of mercury exposure, by limiting their fish consumption to low mercury fish. We therefore urge FDA/EPA to focus both the content of their advice, and their communication efforts, on educating the public as to which fish are low mercury, and the benefits of eating those fish. Proper communication is significantly lacking at this time, contributing significantly to consumer confusion, which in turn is likely a contributing factor to underconsumption of fish broadly. Women of childbearing age should eat at least 8 and up to 12 ounces of fish per week of lower mercury fish. We agree with this recommendation, provided FDA/EPA can define, and broadly communicate, which fish are “lower” in mercury. Consumers need more information than just the names of the seven fish that the FDA identifies in their current draft guidance. Under Question 2 of its draft advice, FDA includes a USDA table that is actually mostly low-mercury fish in order of omega-3 content. There are many flaws with this table, but this could be a useful item for consumers if the flaws were remedied. As a first step, FDA should identify this table as containing lower-mercury fish. FDA is correctly concerned that it is very difficult to draw bright lines. However, that is no excuse for FDA to throw up its hands and give no help to pregnant women who may have a toddler to feed, a family to cook for, and a job. These consumers should not be left to figure it out for themselves because FDA/EPA finds the task too difficult or controversial. 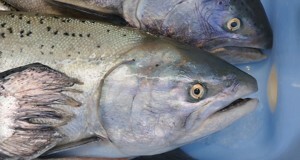 The agencies may have to draw an arbitrary line in order to define lower-mercury fish. Consumers Union would regard this as an acceptable approach since it gives women some help. Some possible bases for defining “lower mercury fish” include the EPA reference dose, a more arbitrary cut-off like 10% of the 1 ppm action level, or fish averaging less than 0.072 ppm, which FDA identifies as the weighted consumption average for mercury in fish. Provided the agencies involved clearly explain their methodology, what’s important is identifying low-mercury fish for consumers. On the existing USDA table in the draft advice, there are a few fish which are not low-mercury; most of them are types of tuna. It is particularly important that No. 4, which is bluefin and albacore tuna, not appear on any recommended list present in FDA/EPA final guidance. Bluefin, in other databases, has had levels as high as 3 ppm, comparable to the fish on the “do not eat” list. Bluefin should be considered for the “do not eat” list. Also, for any table FDA includes in its final advice to consumers, the values should be consistent with the values in its own database. At this point, the levels in the USDA table included in the draft advice are similar but not the same, and some are quite different, like lobster. The database from USDA is also missing half a dozen types of good low-mercury fish that appear on the FDA database that’s linked from the footnote to Question 5. Finally, FDA/EPA should factor in spikes and maximums in giving advice to consumers on fish consumption and identifying lower mercury fish. Consumer Reports prepared advice to consumers which appeared in its October 2014 issue, in the article “The great fish debate” (copy attached). This includes a chart listing both “lowest” mercury fish—salmon, shrimp, sardines, tilapia, scallops, oysters and squid—and a list of “low-mercury” fish—another eleven species (haddock, Pollock, flounder, sole, catfish, trout, Atlantic mackerel, Atlantic croaker, mullet, crawfish and crab). Consumer Reports’ criteria for the lowest mercury fish were that they should have an average mercury concentration of 0.027 or less and that the maximum should not exceed 0.025 ppm. That’s the level at which a 60 kg woman would exceed the EPA reference dose after eating just 6 ounces. FDA/EPA may want to pick a different demarcation point or define it in another way, but we urge you to consider both averages and maximums. Target audiences should avoid shark, swordfish, tilefish and king mackerel. Consumers Union agrees with and urges the agencies to retain this advice. Advise target audiences to eat tuna but limit consumption of albacore to 6 ounces a week. We strongly disagree with the report of the Dietary Guidelines Advisory Committee, which suggested that FDA and EPA should reevaluate, and revise upward, their recommendation that women of childbearing age should limit their albacore tuna intake to 6 ounces per week. We believe instead that FDA should recommend that pregnant women eat NO tuna. Based on new information in the FDA database, even in chunk light tuna, 20% of the samples exceeded 0.25 ppm, and experts we consulted expressed concern that spikes like that during the pregnancy could harm the fetus or put the fetus at risk. Levels in albacore tuna average much higher and include even higher spikes. Other women of childbearing age, young children, and people who consume large amounts of fish should limit the types and quantities of tuna they consume. The amount they can safety consume should be based on the EPA Reference Dose, which would predict that a woman of average weight should eat no more than 4.5 ounces a week of albacore, or approximately the amount in one can. Significantly more chunk light could be safety consumed. The amount that can be consumed by people of different bodyweights appears in the October 2014 Consumer Reports article, “The Great Fish Debate” attached. Retain 2004 advice on fish caught in local streams. Consumers Union supports this recommendation. Extend recommendations in the 2004 advice to young children. Consumers Union agrees, and agrees that advice regarding smaller portions is appropriate. FDA should specifically give advice on canned chunk light and albacore tuna consumption for young children based on their weight and the EPA Reference Dose. Note that fish provides health benefits for the general public. While it is correct that fish consumption can provide benefits to the general public, it also entails risks and FDA/EPA advice has been lacking in advice to one particular risk group—“high-end” fish eaters. We strongly urge FDA/EPA to add to your target groups people at the upper end of the spectrum, what we call high-end fish eaters. Consumer Reports defined this group as people who consume more than 24 ounces a week on average, twice the FDA recommended amount. People who are Asian, Scandinavian, and most notably, older people who are trying to have a heart-healthy diet tend to fall in this group. Consumer Reports documented the case of Richard Gelfond, the CEO of IMAX, who gave himself mercury poisoning by eating fish several times a day and concentrating on swordfish, tuna steaks and other high mercury fish. Dr. Jane Hightower has also documented similar cases. We strongly urge FDA/EPA to provide cautionary advice to people who eat large quantities of fish, to choose lower mercury species. While the content of FDA/EPA advice is extremely important, a more comprehensive communications strategy is needed to influence consumer behavior. Simply posting material on the FDA website is not enough. What is posted is very important, because it’s the template for educators and journalists and doctors to give advice from. However EPA/FDA should also consider other communication methods. The best choice would be posters at the point of sale that indicate the “do not eat” list for pregnant women and also a list of recommended low-mercury fish. That’s the easiest, most effective way to communicate to fish consumers. Also very effective would be to create an easy-to-use downloadable flyer that would have this type of information, both the very high-mercury fish and the lower-mercury fish, that could be handed out in a doctor’s office. Consumers Union supports the addition of orange roughy and marlin to the list of fish that the agencies suggest that target groups avoid. Consumers Union also urges consideration of bluefin and bigeye tuna for this list, since they have very high maximum and peak mercury levels, comparable to the other fish already on this list.